Our February 1st Meeting, 10 a.m. till noon @ Tri Point YMCA, 3233 North St. Mary's Street, Room #1. County Judge, Commissioner Pct. 4, District Attorney, Justice of the Peace Precinct 4, Place 2. 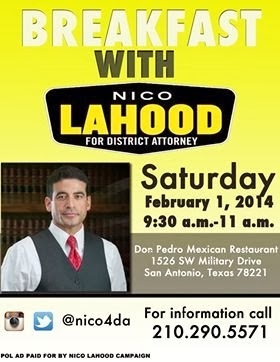 Join your next Bexar County Commissioner Pct. 4 @ a Fired Up and Ready to Go Rally! 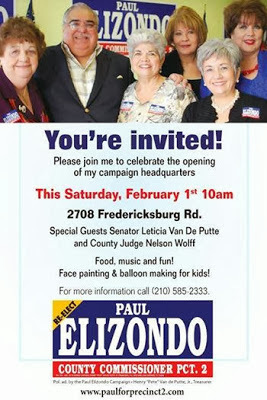 Saturday, February 1st at the Campaign Central Headquarters, 102 West Josephine. Rally begins at noon. Phone banking and block walking will take place after the program. Please join the team at Rancho Grande Mexican Restaurant, 3719 SE Military Dr. @ 3 p.m. for a meet and greet for Yolanda Acuna Uresti candidate for Justice of the Peace Pct. 4 Pl.2. Drinks & appetizers. All other candidates are invited to attend and introduce themselves to the community. Looking forward to seeing everyone there.